Renovated 2017! Luxurious hotel & ryokan with private onsen baths & free shuttle. 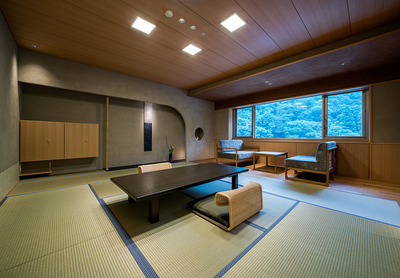 Nishimuraya Hotel Shogetsutei is a combination of modern hotel & traditional ryokan. Non-smoking Japanese-style rooms, in-room kaiseki dinner, free shuttle service, complimentary Wi-Fi, private onsen spas & aroma treatment massage are just some features to make your stay a relaxing one! All guests receive free pass to the public hot springs of Kinosaki Onsen. Shogetsutei is proud to be the sister ryokan of Nishimuraya Honkan and carry on Nishimuraya's commitment to the very best guest service. We are looking forward to welcoming you to Kinosaki Onsen! NEW!! Renovated in 2017, new improvements included a refreshed interior, laundry & vending corner and total redesign of our Japanese-Style: Standard Room type, including the introduction of our first non-smoking Japanese-style rooms! Our standard Japanese-style guest room with views of the town side of Kinosaki Onsen, the size of the room is 10 tatami mats and accommodates up to 5 adult guests. ※Information on the entire Tajima area is available in English. Reception Hours : 9:00 a.m. - 18:00 p.m. Reception Hours : Weekday 9:00 a.m. - 17:30 p.m.